Ohio artist Maya Lin was one of 21 recipients of the Presidential Medal of Freedom. Ohio artist Maya Lin was one of 21 recipients yesterday to receive the Presidential Medal of Freedom, the nation’s highest civilian honor. Lin joined other innovators, artists, and pioneers in a ceremony in the White House East Room. “The Presidential Medal of Freedom is not just our nation’s highest civilian honor – it’s a tribute to the idea that all of us, no matter where we come from, have the opportunity to change this country for the better. From scientists, philanthropists, and public servants to activists, athletes, and artists, these 21 individuals have helped push America forward, inspiring millions of people around the world along the way,” said President Barack Obama. Other Medal of Freedom recipients included Kareem Abdul-Jabbar, Elouise Cobell, Ellen DeGeneres, Robert De Niro, Richard Garwin, Bill and Melinda Gates, Frank Gehry, Margaret H. Hamilton, Tom Hanks, Grace Hopper, Michael Jordan, Lorne Michaels, Newt Minow, Eduardo Padrón, Robert Redford, Diana Ross, Vin Scully, Bruce Springsteen, and Cicely Tyson. 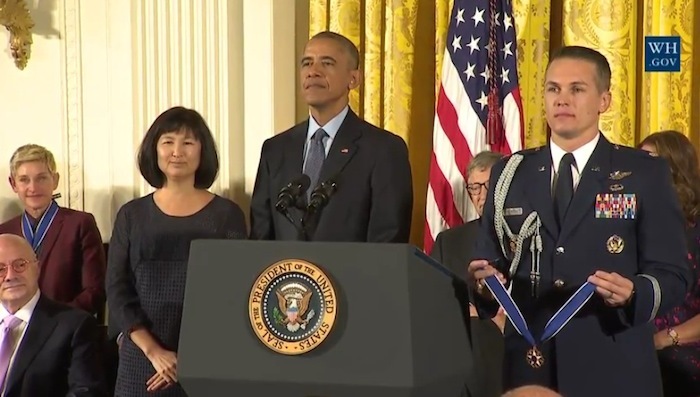 “Her sculptures, chapels, homes are physical acts of poetry each reminding us that the most important element in art or architecture is human emotion,” said President Obama as he awarded Lin the Medal of Freedom. Lin designed the Vietnam Veterans Memorial as a school project when she was just 21. Topographic Landscape by Maya Lin, Columbus Museum of Art permanent collection. Hundreds of MDF boards are stacked on the floor to create undulating curves that resemble the rolling hills of Southern Ohio where Lin grew up. 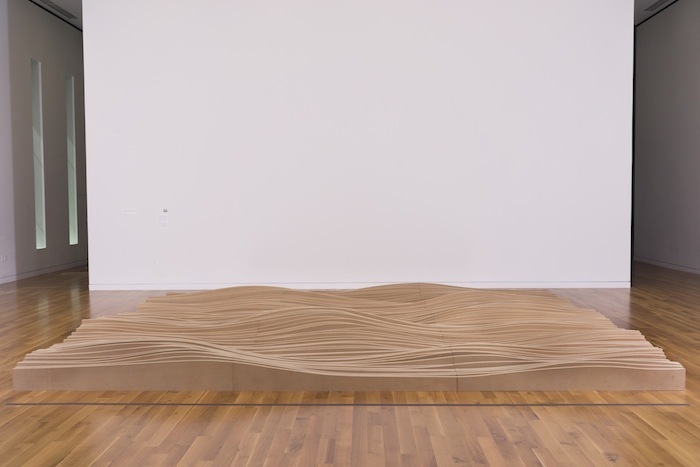 Topographic Landscape by Maya Lin is part of Columbus Museum of Art’s permanent collection. Hundreds of MDF boards are stacked on the floor to create undulating curves that resemble the rolling hills of Southern Ohio where Lin grew up. The sculpture is on view now in CMA’s Walter Wing. Watch the full Medal of Freedom ceremony here. –Jennifer Poleon is Digital Communications Manager for Columbus Museum of Art, and the organizer for CMA’s 2015 #MobilePhotoNow mobile photography exhibition.